Star Skater APK 1.6 is available, not long after Halfbrick announced the Star Sk8R game, the famous game developers with Fruit Ninja and Jetpack Joyride has now been released via the soft launch of the game is in progress in New Zealand and other countries. 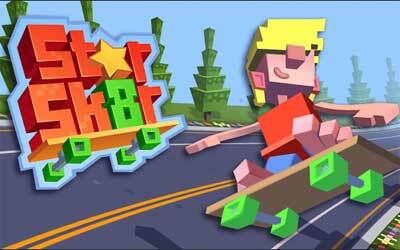 Star Skater is an arcade game that challenges you to skate with board skateboard down a hill. Halfbrick has prepared dozens of levels with the higher difficulty levels in which you must navigate avoid passing vehicles, a hole in the surface, until the road markings boards scattered along the track. You will also be dealing with the time limit in each level. Like the arcade racing game, sledding down the hill and penetrate the checkpoint is limited to the time becoming narrow. Thus, an addition amount of time the items contained in the track becomes a crucial object that must you take to be able to pass through the level with success. In addition to the obstacles and the time constraints, Star Skater also presents a leap trick system that can increase the amount of gain scores. Various basic styles you can do here, like circling in the air, to change the position of skating to get extra points. In terms of graphics, Halfbrick decided to follow the trend lately using voxel style to display the overall graphics in the game, like in Minecraft and Crossy Road. All things, from the character that you control up to various objects in the game, performed with a shape similar to a collection of cubes piled. Resemblance to Crossy Road not just stop there. Star Skater also adopt a system of free-to-play with the lure of character variation skaters can be obtained through Gachapon machine. To perform retrieval in the machine, you can collect a score to obtain it at any level, watch the ads displayed, or buy IAP in the game. Leave your mark… on the asphalt. This game has amazing graphics and cool unlocks you can unlock multiple skateboards,weeks and players.